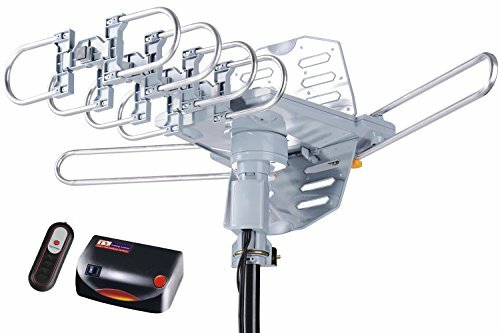 This outdoor HDTV antenna is designed to receive digital TV UHF/VHF signals while providing high quality HDTV picture. You can enjoy high definition television without the high cost of cable or satellite. With a built-in rotor, Turn a full 360 degrees using the infrared remote control. 150 Miles Long Range and Dual TV Outputs --Full HDTV support 720p, 1080i, 1080p | Working Frequency: VHF 170~230MHz | UHF 470~860MHz | Receive free digital broadcast high definition TV signals. Support 2 TVs at the same time without a spliter. no special adapter needed. Snap-On Installation--Snap On Elements no tools required. Comes with an easy-to-follow user manual so you can install the antenna with ease. Mounting pole not included - Put B07BNSL21G into Amazon search box for pole. Wireless remote controller -- Built-in 360 degree motor rotor | Built-in Super High Gain and Low Noise Amplifier | includes 40FT outdoor TV antenna Coaxial cable. Easy for you to place it to get the best reception in your house. Weather Resistant-- 150 miles antenna is for outdoor using. Antenna is lightning protected, durable design with grounding done -don't get struck out by bad weather. What you get -- pingbingding outdoor antenna with wireless remote, power supply adapter and 40FT coaxial cable.Together with 45 Days Money Back, One Year Guarantee and Friendly, Easy-to-reach Support. If you have any questions about this product by pingbingding, contact us by completing and submitting the form below. If you are looking for a specif part number, please include it with your message.